Clashes continued between Jaish al-Islam and the joint forces of the Al-Rahman Corps and Hayat Tahrir al-Sham (formerly Jabhat al-Nusra, the Syrian branch of al-Qaeda) in the Eastern Ghouta region near Damascus. The Al-Rahman Corps and Hayat Tahrir al-Sham (HTS) captured the village of Beit Sawa from Jaish al-Islam. Earlier this week, Jaish al-Islam killed a commander of the Al-Rahman Corps “Samer Al-Saleh” after he had surrendered to Jaish al-Islam members. According to reports, 146 people, including 30 civilians, have been killed in the on-going fighting between militant groups in Eastern Ghouta. The infighting among militants erupted in Eastern Ghouta in late April after the Al-Rahman Corps and HTS had blamed Jaish al-Islam for their failure at breaking the siege on the al-Qaboun pocket where members of Al-Rahman corps, Ahrar al-Sham, and the HTS were encircled by government forces. Prominent Iranian Major General Qasem Soleimani, a commander of the Quds Force of the Islamic Revolutionary Guard Corps (IRGC), has been wounded in the Syrian province of Daraa, near the border with Jordan, according to a number of pro-opposition and pro-opposition media activists. Reports have not been confirmed by photo or video evidence and have not been commented on by the Iranian Defense Ministry. The Quds Force is a special forces unit of the IRGC responsible for extraterritorial operation. In Syria, Soleimani is responsible for overseeing the various pro-Iranian militias operating in the country and coordination of the Iranian efforts with Damascus and Moscow. Reports about the alleged incident followed a deployment of large Syrian army reinforcements to the province of Daraa in order to repel the on-going operation of HTS and its allies in the provincial capital. The deployed reinforcements should allow government forces to stabilize the situation in the provincial capital. Meanwhile, the Syrian army and Hezbollah have carried out a series of operations against militants in the Daraa countryside. 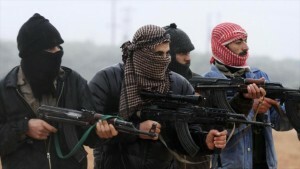 Pro-government forces targeted 3 vehicles of Jaish Al-Islam and other Free Syrian Army groups with IEDs on the road between Al-Masifra and Al-Karak, on the road between the city of Basra al-Harir and the town of Naheta, and on the road of the village of Umm al-Mayazn. Dozens of Jaish al-Islam militants were killed. ISIS announced that 16 suicide bombers attacked positions of the Syrian Democratic Forces (SDF) in the town of Al-Shadadi in the Al-Hasakah province. The suicide bombers managed to sneak into the city and attacked positions of the SDF and the US Special Forces in the districts of Masakin al-Ghar and Al-Mitin. Two other groups attacked positions allegedly belonging to the Kurdistan Workers’ Party (PKK) in the village of Al-Hariri and the vicinity of the Rujm Salibi camp. ISIS militants shelled positions inside Al-Shaddadi with heavy artillery and Grad rockets during the operation. The SDF denied that ISIS members were able to penetrate the group’s defensive lines. Yesterday, ISIS launched an attack on SDF positions in Al-Sifsafeh in the eastern part of the town of Tabqa. The SDF repelled the attack, killed a group of ISIS militants, and destroyed a technical. The SDF also announced that clashes in northern districts of Tabqa continued and SDF troops killed 20 ISIS militants and seized many weapons and ammunition.